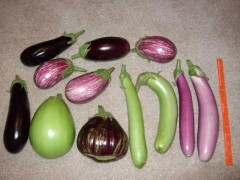 Eggplants come in a wide variety of shapes, sizes and colors. Standard eggplants produce egg-shaped shiny purple fruit that are 6-9″ long. The long slender types (also known as Japanese types) have thinner skin and a more delicate flavor. All types of eggplant can be grown in containers and make excellent patio gardens. However, yields per plant in containers will be lower than garden yields. White ornamental varieties are available and edible but not as tasty as the purple and green varieties. Check out these Eggplant Recipes.